The national salad of Lebanon, this popular dish is perfect for summer. 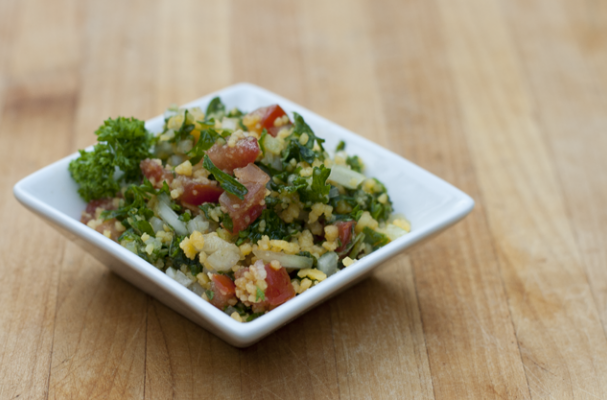 Quick and easy, tabouleh is a great side salad to kebabs, burgers, grilled chicken and seafood. Full of flavor from fresh parsley and mint, this crisp salad is an excellent alternative to potato or macaroni salad at your next barbecue or picnic! Looking for an appetizer? Serve with pita and hummus for a tasty starter! Gluten free? Don't be discouraged! While couscous/bulgur is definitely on the "no-no" list for those who are gluten intolerant or have celiac disease, there are tons of great alternatives! Try using cooked and cooled quinoa or gluten free "couscous" (made from corn) - as seen in the picture above!